The Mid-Pacific Mountains (MPM) is a large oceanic plateau located in the central North Pacific Ocean or south of the Hawaiian–Emperor seamount chain. Of volcanic origin and Mesozoic in age, it is located on the oldest part of the Pacific Plate and rises up to 2 km (1.2 mi) (Darwin Rise) above the surrounding ocean floor and is covered with several layers of thick sedimentary sequences that differ from those of other plateaux in the North Pacific. About 50 seamounts are distributed over the MPM. 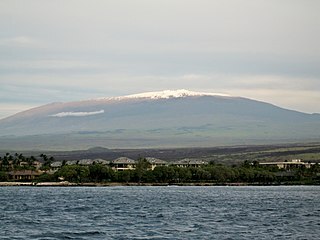 Some of the highest points in the range are above sea level which include Wake Island and Marcus Island. An oceanic or submarine plateau is a large, relatively flat elevation that is higher than the surrounding relief with one or more relatively steep sides. The Hawaiian–Emperor seamount chain is a mostly undersea mountain range in the Pacific Ocean that reaches above sea level in Hawaii. It is composed of the Hawaiian ridge, consisting of the islands of the Hawaiian chain northwest to Kure Atoll, and the Emperor Seamounts: together they form a vast underwater mountain region of islands and intervening seamounts, atolls, shallows, banks and reefs along a line trending southeast to northwest beneath the northern Pacific Ocean. The seamount chain, containing over 80 identified undersea volcanoes, stretches over 5,800 kilometres (3,600 mi) from the Aleutian Trench in the far northwest Pacific to the Loʻihi seamount, the youngest volcano in the chain, which lies about 35 kilometres (22 mi) southeast of the Island of Hawaiʻi. The Pacific Plate is an oceanic tectonic plate that lies beneath the Pacific Ocean. At 103 million square kilometres (40,000,000 sq mi), it is the largest tectonic plate. In marine geology, a guyot, also known as a tablemount, is an isolated underwater volcanic mountain (seamount) with a flat top more than 200 m (660 ft) below the surface of the sea. The diameters of these flat summits can exceed 10 km (6.2 mi). Guyots are most commonly found in the Pacific Ocean, but they have been identified in all the oceans except the Arctic Ocean. In geology, the places known as hotspots or hot spots are volcanic regions thought to be fed by underlying mantle that is anomalously hot compared with the surrounding mantle. Their position on the Earth's surface is independent of tectonic plate boundaries. There are two hypotheses that attempt to explain their origins. One suggests that hotspots are due to mantle plumes that rise as thermal diapirs from the core–mantle boundary. The other hypothesis is that lithospheric extension permits the passive rising of melt from shallow depths. This hypothesis considers the term "hotspot" to be a misnomer, asserting that the mantle source beneath them is, in fact, not anomalously hot at all. Well-known examples include the Hawaii, Iceland and Yellowstone hotspots. A superswell is a large area of anomalously high topography and shallow ocean regions. These areas of anomalous topography are byproducts of large upwelling of mantle material from the core–mantle boundary, referred to as superplumes. Two present day superswells have been identified: the African superswell and the South Pacific superswell. In addition to these, the Darwin Rise in the south central Pacific Ocean is thought to be a paleosuperswell, showing evidence of being uplifted compared to surrounding ancient ocean topography. Allison Guyot is a tablemount (guyot) in the underwater Mid-Pacific Mountains of the Pacific Ocean. It is a trapezoidal flat mountain rising 1,500 metres above the seafloor, with a summit platform 35 by 70 kilometres wide. The Mid-Pacific Mountains lie west of Hawaii and northeast of the Marshall Islands, but at the time of their formation were located in the Southern Hemisphere. The western half of the Easter hotspot chain, a lineament that includes the Line Islands and Tuamotu archipelago, begins near the eastern part of the MPM. The formation of the MPM thus probably occurred at the Pacific-Farallon Ridge and the Easter hotspot, or where the Easter Microplate is now located. The Easter hotspot is a volcanic hotspot located in the southeastern Pacific Ocean. The hotspot created the Sala y Gómez Ridge which includes Easter Island and the Pukao Seamount which is at the ridge's young western edge. Easter Island, because of its tectonomagmatic features, represents an end-member type of hotspot volcano in this chain. The Line Islands, Teraina Islands or Equatorial Islands, is a chain of atolls and coral islands. Kingman Reef is largely submerged and Filippo Reef is shown on some maps, although its existence is doubted. The islands were formed by volcanic activity and are located in the central Pacific Ocean, south of the Hawaiian Islands. The 11 islands stretch for 2,350 kilometres in a northwest–southeast direction, making it one of the longest island chains of the world. Eight of the islands form part of Kiribati, while the remaining three are United States territories grouped with the United States Minor Outlying Islands. Only Kiritimati and Tabuaeran atolls and Teraina Island have a permanent population. The Pacific-Farallon Ridge was a spreading ridge during the late Cretaceous that extended 10,000 km in length and separated the Pacific Plate to the west and the Farallon Plate to the east. It ran south from the Pacific-Farallon-Kula triple junction at 51°N to the Pacific-Farallon-Antarctic triple junction at 43°S. As the Farallon Plate subducted obliquely under the North American Plate, the Pacific-Farallon Ridge approached and eventually made contact with the North American Plate about 30 million years ago. On average, this ridge had an equatorial spreading rate of 13.5 cm per year until its eventual collision with the North American Plate. In present day, the Pacific-Farallon Ridge no longer formally exists since the Farallon Plate has been broken up or subducted beneath the North American Plate, and the ridge has segmented, having been mostly subducted as well. The most notable remnant of the Pacific-Farallon Ridge is the 4000 km Pacific-Nazca segment of the East Pacific Rise. ↑ Ladd, H.S. ; Newman, W.A. ; Sohl, N.F. (1974). Cameron, A.M.; Cambell, B.M. ; Cribb, A.B. ; Endean, R.; Jell, J.S. ; Jones, O.A. ; Mather, P.; Talbot, F.H., eds. Darwin guyot, the Pacific's oldest atoll (PDF). Second International Coral Reef Symposium. 2. Brisbane, Australia: The Great Barrier Reef Committee. p. 513. (Subscription required (help)). Clouard, V.; Bonneville, A. (2001). "How many Pacific hotspots are fed by deep-mantle plumes?". Geology. 29 (8): 695–698. doi:10.1130/0091-7613(2001)029<0695:HMPHAF>2.0.CO;2 . Retrieved 9 September 2018. Hamilton, E. L. (1956). "Sunken Islands of the Mid-Pacific Mountains". 64 : Sunken Islands of the Mid-Pacific Mountains. Geological Society of America Memoirs. 64. Geological Society of America. pp. 1–92. doi:10.1130/MEM64-p1 . Retrieved 26 October 2017. Karig, D. E.; Peterson, M. N. A.; Short, G. G. (1970). "Sediment-capped guyots in the Mid-Pacific Mountains". Deep Sea Research and Oceanographic Abstracts. 17 (2): 373–378. doi:10.1016/0011-7471(70)90029-X . Retrieved 26 October 2017. Kroenke, L. W.; Kellogg, J. N.; Nemoto, K. (1985). "Mid-pacific mountains revisited". Geo-marine Letters. 5 (2): 77–81. doi:10.1007/BF02233931. Menard, H. W. (1959). "Geology of the Pacific sea floor". Experientia. 1 (6): 205–213. doi:10.1007/BF02158108. Thiede, J.; Dean, W. E.; Rea, D. K.; Vallier, T. L.; Adelseck, C. G. (1981). "The geologic history of the Mid-Pacific Mountains in the central North Pacific Ocean: a synthesis of deep-sea drilling studies". Initial Reports of the Deep Sea Drilling Project. 62: 1073–1120. doi:10.2973/dsdp.proc.62.162.1981 . Retrieved 2 September 2018. Wilde, P. (2010). "Supervolcanoes in the Mid-Pacific Mountains?". AGU Fall Meeting Abstracts. 13: V13C–2368. Bibcode:2010AGUFM.V13C2368W . Retrieved 26 October 2017. Winterer, E. L.; Metzler, C. V. (1984). "Origin and subsidence of guyots in Mid‐Pacific Mountains". Journal of Geophysical Research: Solid Earth. 89 (B12): 9969–9979. doi:10.1029/JB089iB12p09969. Winterer, E. L.; Sager, W. W.; Firth, J. V.; Sinton, J. M. (1995). "31. Synthesis of Drilling Results From the Mid-Pacific Mountains: Regional Context and Implications". Proceedings of the Ocean Drilling Program, Scientific Results. 143. Retrieved 2 September 2018. In computing, a Digital Object Identifier or DOI is a persistent identifier or handle used to identify objects uniquely, standardized by the International Organization for Standardization (ISO). An implementation of the Handle System, DOIs are in wide use mainly to identify academic, professional, and government information, such as journal articles, research reports and data sets, and official publications though they also have been used to identify other types of information resources, such as commercial videos. The bibcode is a compact identifier used by several astronomical data systems to uniquely specify literature references. Koko Guyot is a 48.1-million-year-old guyot, a type of underwater volcano with a flat top, which lies near the southern end of the Emperor seamounts, about 200 km (124 mi) north of the "bend" in the volcanic Hawaiian-Emperor seamount chain. Pillow lava has been sampled on the north west flank of Koko Seamount, and the oldest dated lava is 40 million years old. Seismic studies indicate that it is built on a 9 km (6 mi) thick portion of the Pacific Plate. The oldest rock from the north side of Koko Seamount is dated at 52.6 and the south side of Koko at 50.4 million years ago. To the southeast of the bend is Kimmei Seamount at 47.9 million years ago and southeast of it, Daikakuji at 46.7. The Macdonald hotspot is a volcanic hotspot in the southern Pacific Ocean. The hotspot was responsible for the formation of the Macdonald Seamount, and possibly the Austral-Cook Islands chain. It probably did not generate all of the volcanism in the Austral and Cook Islands as age data imply that several additional hotspots were needed to generate some volcanoes. The Tasmantid Seamount Chain is a 2,000 km (1,200 mi) long chain of seamounts in the South Pacific Ocean. The chain consists of over 16 extinct volcanic peaks, many rising more than 4,000 m (13,000 ft) from the seabed. It is one of the two parallel seamount chains alongside the East Coast of Australia; the Lord Howe and Tasmantid seamount chains both run north-south through parts of the Coral Sea and Tasman Sea. These chains have longitudes of approximately 159°E and 156°E respectively. Arago hotspot is a hotspot in the Pacific Ocean, presently located below the Arago seamount close to the island of Rurutu, French Polynesia. The Tarava seamounts are a group of seamounts in the southern Pacific Ocean, southwest of the Society Islands. They are formed by five guyots and a number of cone-shaped seamounts. Of Eocene-Oligocene age, they may have formed under the influence of a hotspot. Wōdejebato is a Cretaceous guyot or tablemount in the northern Marshall Islands, Pacific Ocean. Wōdejebato is probably a shield volcano and is connected through a submarine ridge to the smaller Pikinni Atoll 74 kilometres (46 mi) southeast of the guyot; unlike Wōdejebato, Pikinni rises above sea level. The seamount rises for 4,420 metres (14,500 ft) to 1,335 metres (4,380 ft) depth and is formed by basaltic rocks. The name Wōdejebato refers to a sea god of Pikinni. Limalok is a Cretaceous-Paleocene guyot/tablemount in the southeastern Marshall Islands, one of a number of seamounts in the Pacific Ocean. It was probably formed by a volcanic hotspot in present-day French Polynesia. Limalok lies southeast of Mili Atoll and Knox Atoll, which rise above sea level, and is joined to each of them through a volcanic ridge. It is located at a depth of 1,255 metres (4,117 ft) and has a summit platform with an area of 636 square kilometres (246 sq mi). Lo-En or Hess is an Albian-Campanian guyot in the Marshall Islands. One among a number of seamounts in the Pacific Ocean, it was probably formed by a hotspot in what is present-day French Polynesia. Limalok lies southeast of Eniwetok which rise above sea level and Lo-En is almost connected to it through a ridge. Ruwitūn̄tūn̄ is a guyot in the Pacific Ocean which reaches a depth of 1,215 metres (3,986 ft) below sea level. It is capped off with a summit platform covered in sediments and some volcanic pinnacles with craters. Basaltic rocks have been found on Ruwitūn̄tūn̄. MIT Guyot is a guyot in the Pacific Ocean that rises to a depth of 1,323 metres (4,341 ft). It has a 20-kilometre-long (12 mi) summit platform and formed during the Cretaceous in the region of present-day French Polynesia through volcanic eruptions. Takuyo-Daisan is a guyot in the Western Pacific Ocean off Japan. It is 1,409 metres (4,623 ft) deep and has a square-shaped flat top surrounded by a perimeter ridge. Several other seamounts lie nearby. Ita Mai Tai is a Cretaceous-early Cenozoic seamount northwest of the Marshall Islands and north of Micronesia. One among a number of seamounts in the Pacific Ocean, it is part of the Magellan Seamounts which may have a hotspot origin although Ita Mai Tai itself may not have formed on a hotspot. The Rarotonga hotspot is a volcanic hotspot in the southern Pacific Ocean. The hotspot was responsible for the formation of Rarotonga and some volcanics of Aitutaki. Resolution Guyot is a guyot/tablemount in the underwater Mid-Pacific Mountains, Pacific Ocean. It is a circular flat mountain that rises 500 metres (1,600 ft) above the seafloor to a depth of about 1,320 metres (4,330 ft), with a 35 kilometres (22 mi) wide summit platform. The Mid-Pacific Mountains and thus also Resolution Guyot lie west of Hawaii and northeast of the Marshall Islands but at the time of its formation it was located in the Southern Hemisphere. Horizon Guyot is a presumably Cretaceous guyot/tablemount in the Mid-Pacific Mountains, Pacific Ocean. It is an over 300 kilometres (190 mi) long elongated ridge that stretches in northeast-southwest direction and has two flat tops; it rises 4.3 kilometres (2.7 mi) to a minimum depth 1,443 metres (4,734 ft). The Mid-Pacific Mountains and thus also Horizon Guyot lie west of Hawaii and northeast of the Line Islands. Darwin Guyot is a volcanic underwater mountain top, or guyot, in the Mid-Pacific Mountains between the Marshall Islands and Hawaii. Named after Charles Darwin, it rose above sea level more than 118 million years ago during the early Cretaceous period to become an atoll, developed rudist reefs, and then drowned, perhaps as a consequence of sea level rise. The flat top of Darwin Guyot now rests 1,266 metres (4,154 ft) below sea level. Takuyo-Daini is a seamount in the Pacific Ocean. Vlinder Guyot is a guyot in the Western Pacific Ocean. It rises to a depth of 1,500 metres (4,900 ft) and has a flat top covering an area of 40 by 50 kilometres. On top of this flat top lie some volcanic cones, one of which rises to a depth of 551 metres (1,808 ft) below sea level. Vlinder Guyot has noticeable rift zones, including an older and lower volcano to the northwest and Oma Vlinder seamount south.